Distilleria / Distillery: Pomace from Nosiola grapes arrives at the distillery just a few hours after the grapes’ pressing. They are entirely de-stemmed and they are placed in tanks, where they carry out the fermentation in an anaerobic and controlled environment. Immediately after 7 to 10 days of fermentation, they, immediately, go into the still. The distillation is made with two pot stills that are bain-marie. The steam is injected through a cavity that heats and brings the raw material to the boil. The proof at distillation is about 70% / 75% alcohol by volume. Right after, the distillate is diluted with water in order to take the product to 42% alcohol by volume and 1% of sugar from sugar beet is added. 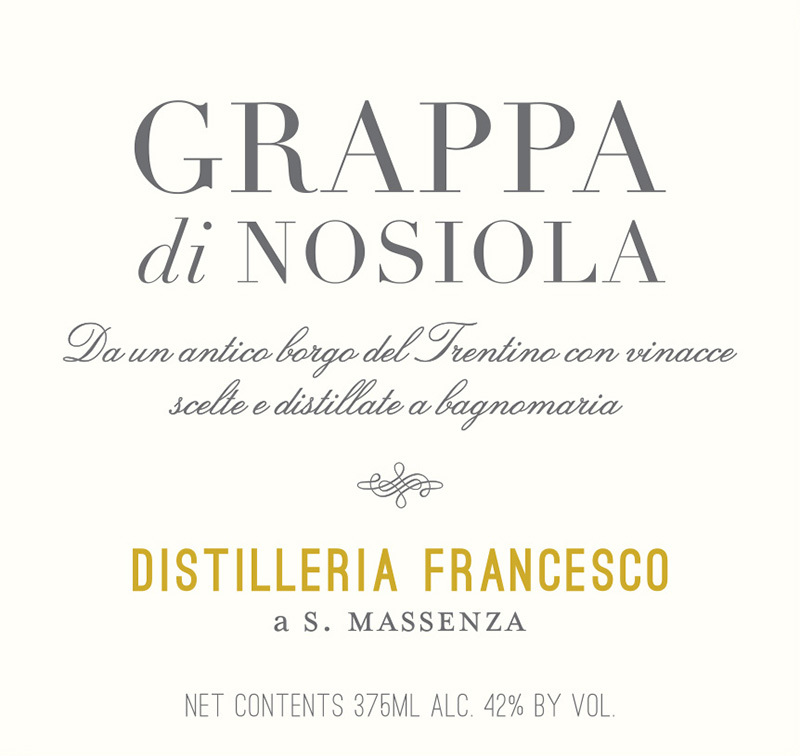 The grappa is refrigerated at -5°C and filtered with carton filters. When the Grappa is bottled, a second filtration takes place. Materia prima / Raw material Fresh pomace of Nosiola grapes from the estate vineyards. Fermentazione alcolica / Alcoholic fermentation: from 7 to 10 days, in stainless steel tanks. Distillazione / Distillation:Discontinuous with head and tail cutting, in copper bain-marie stills. Altri prodotti aggiunti? / Other products added? : waterr and 1% of sugar from sugar beet. Chiarificazione, filtrazione / Clarification, filtration: refrigerated at -5°C and filtered with carton filters. Gradazione alcolica / Alcoholic %: 42%. Tappo e bottiglia / Closure and bottle: 375 ml Oslo trasparent bottle.